There are some great converts out there to cloth diapering. Some parents have had multiple children and have used disposable diapers until they discovered cloth. I’ve learned parents research cloth the moment they are expecting – thanks for those calls of enthusiasm! Other parents are interested in setting up with cloth diapers the week before baby is here – close calls! Even still, my favourite caller is from a parent of a child who is showing signs of potty training at about 18 months of age and they are too excited to get out of diapers! They are ready to switch to cloth if it may mean getting rid of the diaper waste! It’s never to late to switch and save money and effort! Who put them up to it? Hopefully, a parent finds it a reason to ditch the wasteful ways and find a healthier method of cloth diapering. And when they do, they love to share it with others! It happened to me and I can say it has happened to many clients of Changing Ways Diaper Service. Can we introduce cloth to the mainstream? Tweets to Ellen DeGeneres have been heating up! Gettting cloth diapers into local and national media spotlights can help others see how big the cloth diaper industry is becoming and why the demand is back for a reusable option for diapering. Can we make this viral? 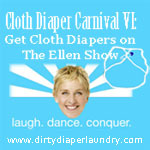 Get Cloth Diapers Featured on The Ellen Show. Tweet a link to @TheEllenShow with #operationfluffy #clothdiapers tags. Once you get on board with cloth, you ask others why not? A dad in town who now advocates for cloth diapers after using them on his son, says he can be almost aggressive when people tell him cloth diapering is too much work. He compares real work with diapers in loading the child into the car for a trip to the big box store, and seeking out the right size diaper at the right price, waiting around to check out and includes hauling the weekly waste to the curb in the work. His alternative? Carry the diaper load to the washer, dump it in, add detergent, and press a button. Now here is a newsclip, compliments of the American newstation CBS, of a journalist who took the challenge to switch to cloth. She interviews the owner of FuzziBunz to demonstrate to viewers what modern cloth diapers are all about! News is spreading! Pass it along! It’s a dirty little secret, but as cloth diaper users, we want to advocate to others how easy it is to take the challenge to switch to cloth! Try the Diaper Loan program for a week, or sign up for a whole month! Give me a good reason not to take a Cloth Diaper Challenge! Would you like to borrow some cloth diapers to try it out for a week? You can certainly do this now through Changing Ways Diaper Service! Under the Gifts & Loaners page you can read the details of how to apply this. If you haven’t figured out within a week if you like the process, you can return everything. If you can handle using cloth part time or full time, I can show you the minimum or maximum gear required to set up! There are many, many websites to go through if you begin the research on cloth diapers. I don’t need to overwhelm you with all the options, and you can try out the most trusted, and economical cloth diaper system around – prefolds plus waterproof covers! Are you expecting a baby and want to learn more? I would love to stop by for an in home demonstration of the cloth diapers and review what concerns and benefits you’ll have in using cloth diapers. This appointment takes an hour’s time and is great to include dad to be and grandparents too! Is your child still in diapers and you’re not sure if it’s too late to try cloth? You are the perfect candidate for the Diaper Loan Program! Invest now and you could still benefit from early toilet-training! Children have been switched to cloth at various ages with an easy transition. Even if toilet training is expected to happen and your own enthusiasm is higher than your child’s, putting cotton against their skin instead of a fancy wicking liner gets the idea about being wet. Toilet training depends upon teaching a child first, what being wet is all about. Have you tried other cloth diaper products and want to switch to prefolds? Pocket diapers and AIO (all in one’s) are great inventions to the cloth diaper world! Each cloth diaper system was created with certain features in mind. All of them are generally easy to use and are designed to have the best fit for baby against leakage. Using them can be another story. Each parent and child have their own ideas. What will suit you the best? Would you like to try out another method before investing? Sign up for the Diaper Loan Program and you can confirm you like your established diaper routine best, or be open to using the two part Bummis system of cotton diaper insert with a diaper cover.